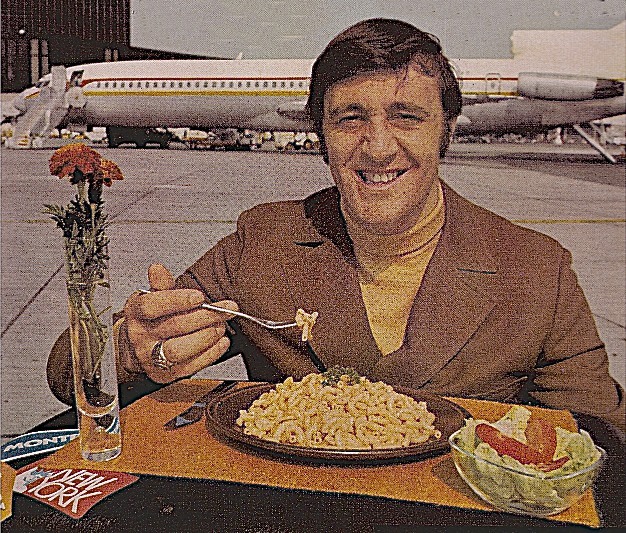 Call It Macaroni: Trades made Phil Esposito depressed and angry. Here, in happier times, he makes the case for Kraft Dinner at the airport. Out on the tarmac. With a side salad. “I guess I’m bitter right now because I’m losing a lot of friends and I won’t be fulfilling my dream of helping the Canucks become a real contender,” Don Lever said when Vancouver dispatched him to the Atlanta Flames in 1980. Eventually he shifted. But in 1946 when the Red Wings tried to send him to the Rangers, he did quit. He was 34. 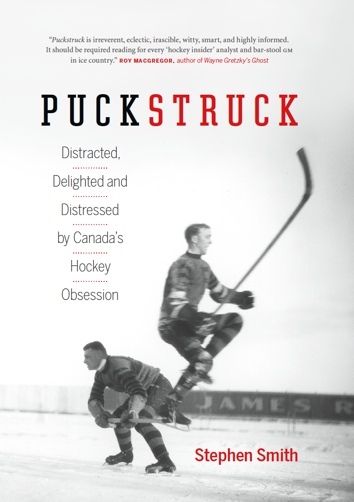 When Red Kelly got traded in 1960, Detroit to New York, he was stunned. “It seemed that he had been evicted from his home,” a biographer wrote. Instead of New York, he went to church, to pray, and seek guidance. Pack it in, I guess, is the word he got, which he did, though later he changed his mind, and God’s, when King Clancy swung a trade to get him to Toronto. Lanny McDonald thought “I can’t go” when the Leaf GM Punch Imlach sent him to Colorado in 1979, but then the coach, Don Cherry, called and he went. Darryl Sittler wept. Before Toronto’s next game, Sittler took a scalpel to the C on his sweater, except that it was triple-stitched, and he ended up slicing up the sweater without quite removing the C and had to get Leafs’ trainer Guy Kinnear to finish the job while he went to tell his teammates he was resigning the captaincy. It was three more (often miserable) years in Toronto for Sittler before he left for Philadelphia, having more or less arranged his own trade. Fans protested McDonald’s departure outside Maple Leaf Gardens, which they’d done in 1968, too, I’m not saying it was the same fans, though maybe, a band of long-suffering activist Leaflovers who thought maybe marching might do some good this time, unlike when Imlach traded Frank Mahovlich to Detroit with Norm Ullman and Paul Henderson coming east. Which is nothing compared to 1988 when Peter Pocklington sold Gretzky to Bruce McNall in Los Angeles. If you weren’t there, don’t remember, have no interest, well, I don’t know if there are words to describe it to you. There’s jumping up and down, of course, and tearing your hair while also furiously waving your arms, but I’m not even sure that really expresses the shock and the awe of the Gretzky trade. Just know: it was big. Fans wore black armbands. They burned Pocklington in effigy, and vowed to boycott his dairy and meat businesses. They jammed the lines at the Northlands Coliseum, threatening to cancel their tickets, never come to another Oilers’ game ever again. Six hundred people called The Edmonton Sun to complain. They blistered the airwaves, somebody wrote. They called Janet Jones Yoko Ono. Mark Messier was distressed. There were rumblings that the Oilers players wouldn’t play. There was talk in the Alberta Legislature. Local politicians said: buy the Oilers! The weather even had a tantrum: as Stephen Brunt tells it in Gretzky’s Tears (2009), at the moment that Gretzky took the microphone at the press conference that awful August day, Edmonton’s sunny sky turned to black, winds howled, rain fell, Gretzky cried — and then it was over. He didn’t cry, but he felt like it. Kristian Huselius and Alexei Kovalev are players who’ve been traded for a bag of pucks, along with R.J. Umberger, Patrick Sharp, and Roberto Luongo when the New York Islanders shipped him to Florida in 2000. Not actually, of course: the exchange on Kovalev (for instance) was four players, including Mikael Samuelsson, and cash. It’s not a phrase that appears in The Complete Hockey Dictionary, “a bag of pucks,” but if it were the definition might say something about lopsided trades that make at least one of the participating GMs look foolish. In case you’re curious, The Hockey News recently valued a bag of pucks at C$84.39, assuming costs of $24.99 for the bag and 99 cents for each of the 60 pucks it holds. Often, as a hockey player, if you’re disgruntled, you’ll be traded, as Dany Heatley, Paul Coffey, Adam Oates, and Petr Nedved know, among others. If you tell your team’s president during a game, “That’s my last game in Montreal,” you’re Patrick Roy, and soon you’ll be winning a Stanley Cup in Colorado. If you’re known as a dressing-room cancer (a terrible phrase, also not in the Dictionary), you may be on your way to a new room. Teams are always looking for glue guys, so if you’re one of those, a Chris Higgins or a Gregory Campbell, then you may be on the move. Same thing if you’re ageing, like John Tonelli was when he left the New York Islanders for Calgary. Likewise if you’re struggling (Alex Zhamnov, Alexei Kovalev); need a fresh start (Cody Hodgson, Matt Gilroy); never bought in to what Ken Hitchcock was selling (Dan McGillis); just want to show you can play in this league (Al Montoya); have always dreamt of playing in Canada (Rick Walmsley); want to get out of Canada (Heatley): pack your bags. Also if you’re a great guy like Ray Bourque who’s never won a Stanley Cup before and you want just one more chance (Bourque). Whereas if you simply ask for a trade (Rick Nash), that may be the best way to make sure you stay in Columbus for a few months more. Esposito was on the road, in Vancouver when he got the news. The coach was Cherry again, and he came to Esposito’s hotel room with Bobby Orr and Cherry was wearing awful pyjamas — the ugliest “I ever saw in my life,” Esposito testifies in his 2003 memoir, Thunder and Lightning. And Esposito said if they told him he was headed to the New York Rangers, he’d leap out the window, and Cherry told Orr, open the window. He hated New York, and not just the Rangers, either, the very idea of the city itself, which was filthy. He had been traded before, from Chicago. “I was really depressed,” he recalled, later. He was at a banquet with Jesse Owens when Bobby Hull phoned to tell him. “The first thing is, your pride is hurt,” he said. Although he kind of did suspect it might be coming. After a few beers in the dressing room he’d told the coach and the general manager that they were bound to screw up a great team. So there was that. The New York trade was worse. Twenty-eight years later, he still hadn’t forgiven Boston GM Harry Sinden. Esposito told George Plimpton it was worse than divorce and deaths in the family. His Bruins pal Wayne Cashman was so mad he hurled his TV out of the window. This is back in the hotel in Vancouver, now. Cashman, also, is supposed to have ordered up 100 sandwiches from room service to punish the Bruins. I don’t know, though: seems like more of a sentence on the kitchen staff.